Spring is just a step away. Temperatures are warming, trees are budding, and outdoor grills are getting ready for action. How much do Americans like to grill? Here’s a clue: Three out of four of us own a grill or smoker. 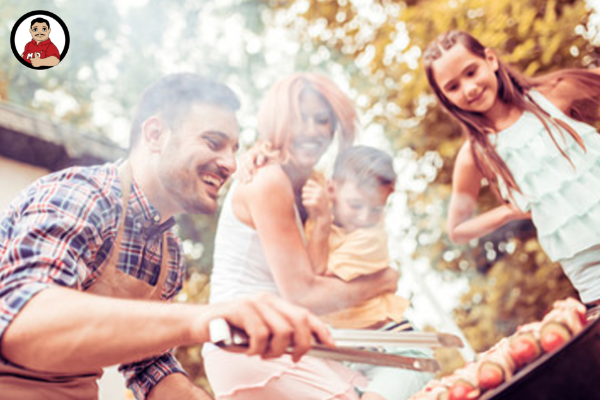 To help Smokey Mo’s customers make the most of grilling time, we’ve put together some tips and tricks for ensuring the best flavor for your home-grilled foods. First, let’s review. What’s the difference between grilling and barbequing? It all comes down to temperature and time. Grilling is hot and fast. Barbeque is low and slow. Next, let’s talk tools. The most essential is the grill or BBQ pit itself. Pits come in an array of types, but let’s focus on the big ones: wood, charcoal, and gas. At Smokey Mo’s, we use a combination wood and gas pit. Visit us at one of our 16 restaurants. We’d love to show you how we do it! Wood pits give that great smoky flavor, but they do take a little more time and attention to keep at a consistent temperature. Charcoal pits are our favorite to use at home. They have that great flavor and keep a relatively steady temperature without too much attention. We recommend offsetting the charcoal so it’s mostly to one side. This gives you the ability to cook with direct or indirect heat. And then propane – easiest to use for temperature, but without the smoke. We highly recommend wood chips if you’re using a gas grill. Other items for your pit masters: heavy-duty tongs and insulated, heat-proof rubber gloves. For fun accessories, you can also add injector kits, sheet pans, rubs, spices, and marinades. First stop: Appetizers. They get the party started – or can be a party unto themselves! We asked Smokey Mo’s staff and Facebook followers to share their best recipes for at-home, on-the-grill appetizers. See below for two of our most popular party starters, cooked on a charcoal grill. Have a favorite appetizer for the grill? Share it with the Smokey Mo’s community! 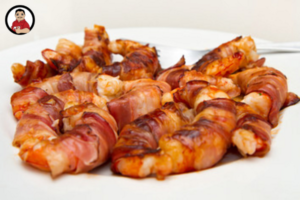 At its core, bacon-wrapped shrimp is simply raw shrimp wrapped in raw bacon and placed on the grill. Seasoned simply with smoke and char. Easy, delicious. Done. But why stick with simple when you can customize? 20 large shrimp, peeled and deveined. Tails off optional. Optional: Because shrimp cooks so quickly, we recommend you precook your bacon until it’s about halfway done, while it’s still soft enough to wrap around the shrimp and just about to turn crispy. Season each shrimp with salt and pepper and other optional seasonings to taste. Wrap half a piece of bacon around each shrimp. Place on the grill for two to three minutes per side, until the shrimp is fully cooked and opaque. Facebook follower Cesar Ugaz likes his applewood bacon-wrapped shrimp slathered with a good barbeque sauce. While you can choose any sauce you like, we’ve sweetened up Smokey Mo’s BBQ sauce for this recipe. The additional sugars create a delicious caramelization for your shrimp. Combine BBQ sauce and honey in a bowl. Set aside a small bowl of the sauce mix to use as a dipping sauce after grilling. Brush the BBQ sauce mixture onto both sides of each shrimp, thoroughly coating. Place on the grill for two to three minutes per side, until the shrimp is fully cooked. Start with 18 three- to four-inch-long jalapenos, large enough to easily stuff. A mix of colors – red, green, and orange – makes for a colorful display. Slice the jalapenos in half, and take out the seeds and ribs. This will remove most of the heat from the peppers. If you like them spicier, leave some of the seeds and ribs in. Stuff the peppers with a combination of Smokey Mo’s chopped and cheddar cheese. 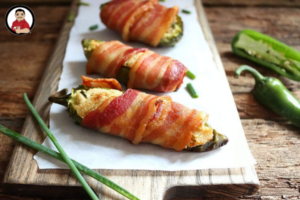 Once the jalapenos are stuffed, wrap them in half a slice of thin-cut bacon. Secure with a toothpick. Remove the toothpicks before serving. Mo ideas: Smokey Mo’s BBQ sauce makes an excellent dip. Follow the link to the recipe here. Mo ideas: Smokey Mo’s carries chorizo. Simplify the prep with an order of fully cooked chorizo from us.